Winter time can be rough for pond owners, especially those with ponds containing valuable or temperature sensitive fish. When ponds become iced over for several months straight, pond pumps cannot function properly, fish can be at risk, decaying plants build up into sludge and toxic gases with no escape accumulate and reduce the quality of the water. In addition, ice is a problem for those who enjoy the company of wild birds. Water is a scarce resource for wild birds in winter, and a frozen pond will discourage them from flocking to your backyard. Luckily, Pet Mountain has the solution! 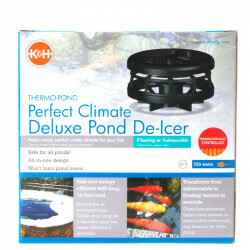 Pond de-icers use extremely low electrical currents to generate heat and prevent the pond from freezing over or suffering from extensive ice buildup. Though they can't prevent the entire pond from freezing over, de-icers maintain a small area of open water that allows harmful gases to be released. 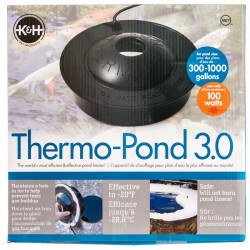 This helps keep fish healthy and your water from becoming foul during the long, cold months. 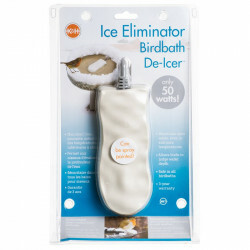 De-icers are available as either floating or submersible devices, whichever works best for your pond. 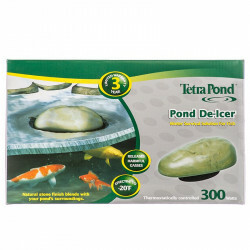 Pet Mountain's Pond De-Icer store features top quality de-icers from the most trusted names in the industry. 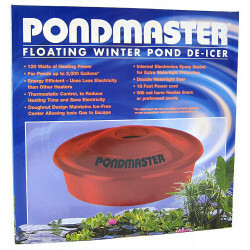 Pondmaster's floating de-icer uses extremely little energy and comes from the pond product leader. K&H Pet Products, the recognized authority on all things heating, offers several varieties of de-icer to meet any situation.